The Sandy Bridge processor--to be announced January 5--will pack media acceleration circuitry, Stephen L. Smith, vice president and director of PC Client operations and enabling at Intel, confirmed at a Wells Fargo Technology, Media, and Telecom Conference held on November 9-10. "The other cool thing is dedicated circuitry for media acceleration," Smith said, responding to a question from the audience. "All of us in our daily use, whether it's home videos or photos tend to pull things from the Internet, pull things from our own capture devices at home, bring them on to our PC, transform them into different formats...all of that will be dramatically faster if one utilizes this hardware acceleration, media acceleration that we have on Sandy Bridge," he said. Sandy Bridge will support DirectX 10.1 and OpenCL 1.1--the latter used on Apple's Mac operating systems, a point Smith didn't mention but which CNET has previously reported. Certain graphics chips from Advanced Micro Devices and Nvidia already support DirectX 11. Both OpenCL and DirectX are frameworks for speeding up games and media applications. He also pointed out that Sandy Bridge should enable slimmer designs that perform more like mainstream laptops. "It enables us to build a notebook with a sleeker form factor and potentially longer battery life and still get great mainstream performance," he said. Smith also reiterated that Intel is on track to deliver the 22-nanometer Ivy Bridge silicon--the follow-on to Sandy Bridge--by the end of 2011. "We're on track to develop our 22 nanometer with units in production by the end of 2011," he said. He also repeated that Intel has invested "six to eight billion dollars to equip up to four factories for 22-nanometer production." 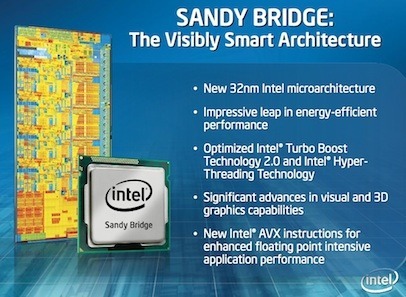 "Ivy Bridge is a shrink of Sandy Bridge with some enhancements," he said. Also a slide showed Intel getting to 8 nanometer chips by 2017. "OpenCL 1.1--the latter used on Apple's Mac operating systems" "Both OpenCL and DirectX are frameworks for speeding up games and media applications"
No, OpenCL is not a Mac framework, OpenCL is an open specification that can be used in windows, linux and mac for GPGPU in non graphic applications (example, nvidia cuda supports openCL), directx or more specifically Direct3D is the framework for making things for games and that stuff and its counterpart is OpenGL (not OpenCL), OpenGL is widely used in non windows systems (and a lot of windows games use it too) like mac os x, linux, playstation 3, nintendo wii, etc.